Using a Cedar Plank is such a simple and elegant technique for cooking salmon. If you’re not interested in the recipe below, scroll down farther and check out the cedar plank purchase options. But definitely consider this recipe – it’s a great one. 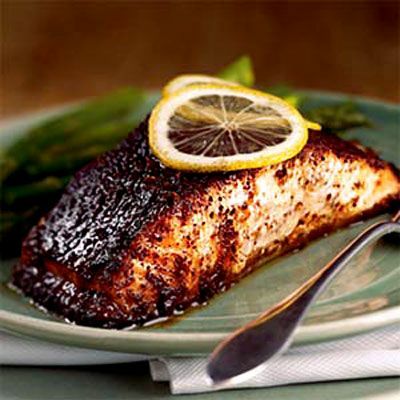 The heat of the grill will gently steam the fish and, unlike cooking directly on the grate, the fish will retain a tender moist flavor. The cedar wood imparts a variety of pleasant woodsy flavors and the grill adds that great bbq smokey taste. You can impart additional tastes by soaking the cedar planks in advance in your favorite flavor. This is salmon like you’ve never tasted before. Excruciatingly delicious. Just be sure to use a fresh (important) wild caught salmon and cook it using a cedar plank. Combine the first 3 ingredients in a zip-top plastic bag; seal and marinate in refrigerator for 1 hour, turning occasionally. Preheat your grill to 400°. Remove the fish from the bag and discard the marinade. Combine sugar and the next 5 ingredients (sugar through cinnamon) in a bowl. Rub over this dry mix on the fish and then place the fish on your cedar plank. For your convenience I’ve listed some of the best cedar planks with links where you can purchase them. Just look below this post. Bake at 400° for 12 minutes or until fish flakes easily when tested with a fork. Serve with lemon slices, if desired. Be sure and clean your cedar plank while it’s warm. It’s so much easier than doing it after the fish dries out on it.